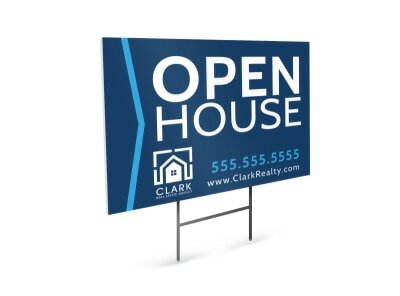 Advertise a home for sale, open house, public auction, or other event with real estate yard signs that create buzz right from the curb. Our templates increase awareness of what you’re offering with the use of attention-grabbing fonts, colors, images, and other elements. Make use of our intuitive online editor to add text, manipulate your sign’s elements, ensuring its maximum visual appeal to passersby. We offer printing of your finished designs, or opt to do your own printing from any location for immediate use of your materials. Get credit (and new clients!) for all of your hard work by ensuring that the entire neighborhood and all passersby know which real estate agent (YOU) is representing each of the properties you’ve got in your portfolio. 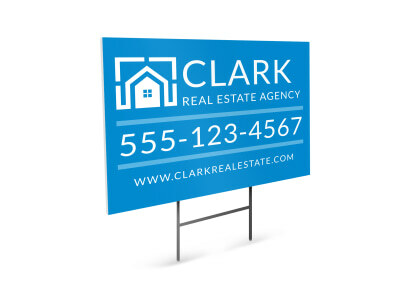 Design your very own real estate agent yard sign and make a new first impression every time someone drives or walks down the street. Use your best professional headshot to guarantee that everyone gets to see a smiling face. Make sure to include your contact information so that interested buyers (or even potential sellers!) can connect with you to schedule a showing. Make it your goal to cover all saleable properties in the area with your name and friendly mug! 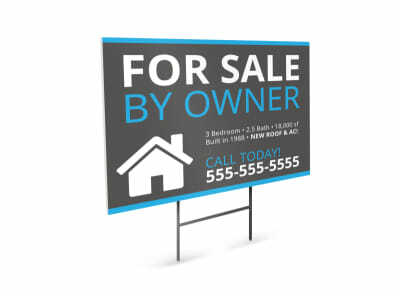 One of the best ways to promote and give credibility to your real estate agency is a yard sign featuring the quintessential “SOLD” verdict. 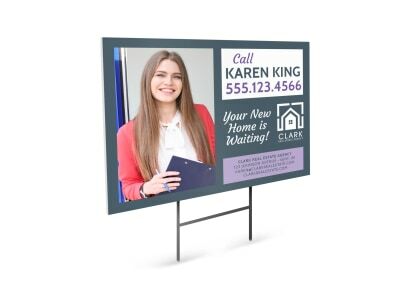 Generate an organic increase in your client base by designing an eye-catching real estate agency yard sign and placing it in the front yard of every property you are working to sell. 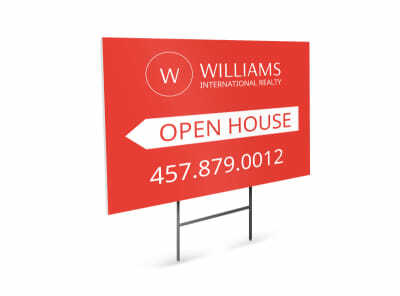 The simple act of updating your sign to “sale pending” or “sold” will build confidence in your sales ability – but you won’t get anyone in the door without creating the sign promoting your agency first. 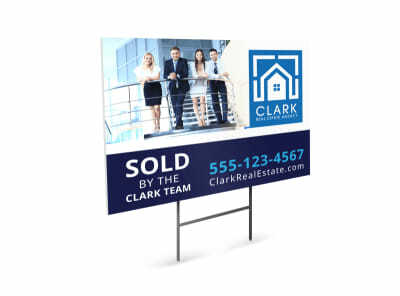 Use our online editor to upload your logo and print a one-of-a-kind yard sign that will put the rest of the neighborhood to shame! 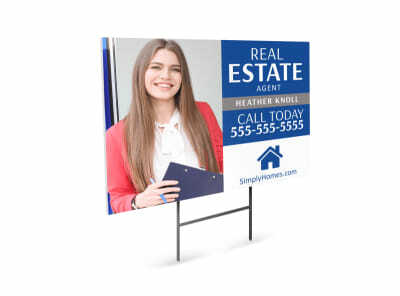 Set your available properties apart with a dynamic and unique “For Sale” yard sign that represents your personality and sales style. 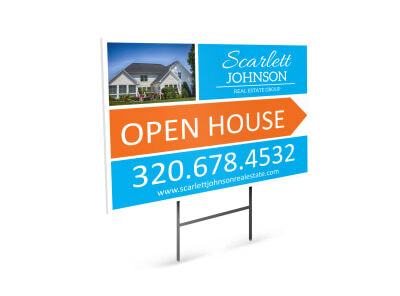 Make your homes stand out from the crowd – design a yard sign that will be remembered! 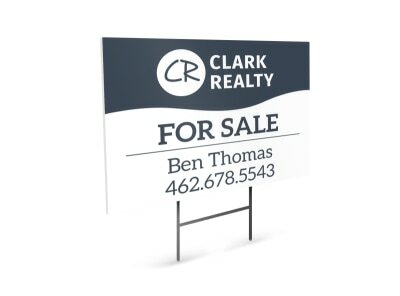 Use bright colors or a catchy slogan, and plaster your contact information in an easy-to-read location. If appropriate, include specific property details (price, square footage). 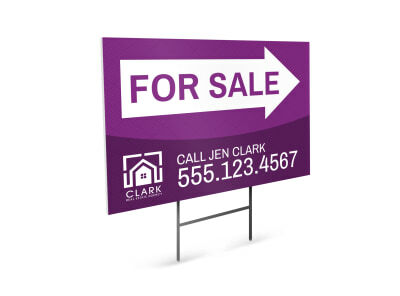 Remember – every sign you put out is also promoting YOU, not just your sale properties, so keep your branding consistent and put your heart into the process. Our online editor makes it easy for you to close the deal – without a notary! Kitchens and baths sell houses, but potential buyers need to SEE them first. 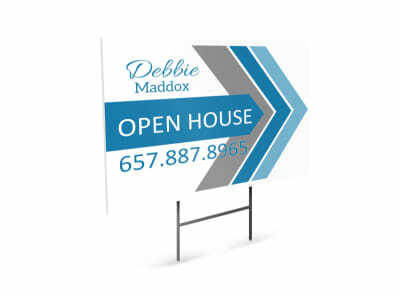 Get them in the door by designing an HGTV®-worthy open house yard sign that would make Drew Scott himself proud! Include the date (“This Sunday”) and time (“1 - 5PM”), along with a note that private showings can be arranged by contacting you directly. Upload one of the professional photos you had taken of the sale property, and include the vital details – price, square footage, beds/baths, special features. 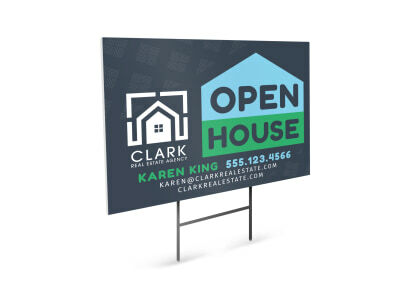 MyCreativeShop’s online editor makes the open house sign design process a snap, but you’ll have to do the staging yourself – go earn your commission!